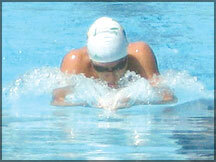 Mathew Abeysinghe is the newest phenomenon to take the Sri Lankan Swimming world by storm. Walking in his brother Andrew’s (SAAF games – 2006 double gold medalist’s) shoes, ‘Mathew shows promise of going way ahead of his older brother in the swimming arena’ says his coach-dad Manoj Abeysinghe. Mathew is a fourteen year old, form four student of Asian International School who recently created waves in the swimming pool, literally and metaphorically as he swam and won the Pentathlon for the Under 16 age group with a record time of 2.20.09secs in the Individual medley. He also won four golds and one silver at the Short course SENIOR NATIONALS setting up new records in the 1500m, 400m free and the 400m fly events. Mathew is a long distance swimmer. 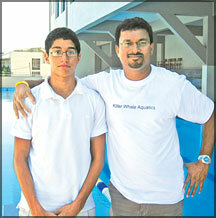 He is trained by coach-dad Manoj at the Air Force pool where he swims for three hours every day, six days of the week. Effortlessly he swims 10 sets of 400m each day. Young as he is- barely fourteen - his lung capacity is as much as that of an adult. Apparently, the Olympic committee has qualifying times for 32 swimmers and then they give two wild cards to any country that has not qualified and still wants to send a swimmer to the Olympics. These wild cards are chosen by a particular country’s Olympics selectors who send their best girl and boy swimmer to the Olympics. ‘Sri Lanka has so far not been able to send one single swimmer who has qualified for the Olympics on their own steam,’ says dad Manoj ‘but Mathew is going to do just that for the 2012 Olympics. Do you think he will be ready to win medals at the 2012 Olympics? Mathew is quite content to let his dad dream for him. Manoj Abeysinghe is a level five certified coach from Ohio, USA. A swimmer for Royal College in his hey days, Manoj Abeysinghe now trains the Air Force squad in their own pool along with his sons Mathew, Dillon and Kyle. Mathew wants to be a doctor when he is done with swimming. Unlike many of the other naturally talented swimmers in the world (including Michael Phelps), Mathew is an academically sound student. He averages A’s in most subjects especially his favourite – the sciences. Mathew is faster than anyone his age in this country, ranks in the top five in the US and has remarkable powers of concentration. Can Mathew retain single-minded focus on swimming, such an isolated sport, for so many years to come, considering that he started swimming at the age of four? Mathew thinks he can. ‘I took a break from swimming for six months at the age of twelve. I made a come-back a few months ago. It has been very very hard to work back into form but I am doing it, slowly but surely. My dad monitors my day -the swimming and rest and fun and of course homework, very closely. ‘I have now learnt how to lose. You figure out your weaknesses and train hard on them and become a better swimmer after that. When I was in the States, I gave up swimming because I lost to a new swimmer who joined our team and was double my height. I could not bear to lose. And then I came back to swimming after my break and beat him in every single event.